India’s squad for ICC Cricket World Cup 2019 is due to be announced today, April 15. While there are no prizes for guessing who the first choice players will be, it is anyone’s guess to fill the remaining vacant spots. Around 11-12 players are automatic choices to be included in the World Cup-bound squad. With the mega tournament to be held in England, chances are India might pick an extra fast-bowler. Jasprit Bumrah, Mohammed Shami, Bhuvneshwar Kumar, and Hardik Pandya are set to be named in the Indian squad for World Cup. India Squad for ICC Cricket World Cup 2019 to Be Announced Today: KL Rahul Could Find a Place in the Team; Rishabh Pant, Dinesh Karthik Might Miss Out. Apart from these, India might go ahead with another seamer as a backup option and that opens the gates for the likes Deepak Chahar, Navdeep Saini, and others. However, if in case selectors decide to pick an extra seamer, it could be Chahar who will make the cut. And this is were MS Dhoni’s ‘reference’ could work for the 26-year-old pacer. 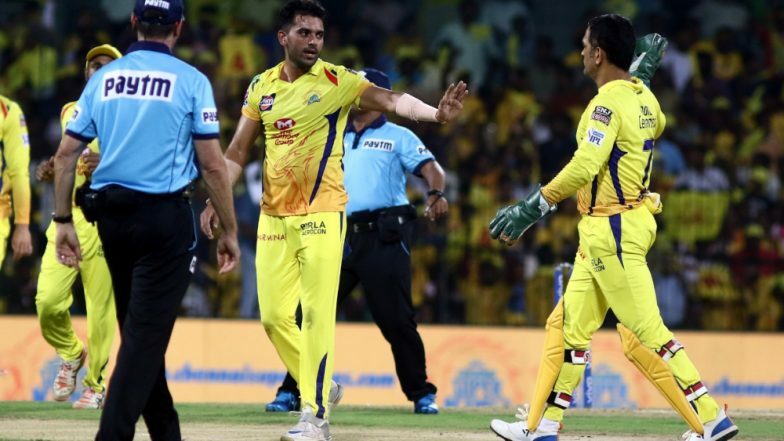 Chahar has been CSK’s one of the strengths in the bowling. The Chennai Super Kings (CSK) captain has used Chahar effectively thus far both upfront and in death overs. In eight matches so far, Chahar has picked ten wickets. But it is his economy of 6.64 that stands out.